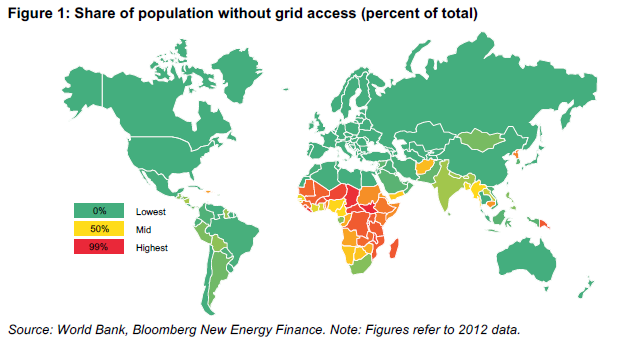 The 1.2 billion people living without access to the power grid spend about $27 billion annually on lighting and mobile-phone charging with kerosene, candles, battery torches or other fossil-fuel powered stopgap technologies. Solar-powered portable lights and home kits offer a better service at lower cost. This report takes stock of what the emerging off-grid solar industry has achieved, looks at the opportunities and challenges facing the sector and assesses the potential of off-grid solar to help achieve universal electricity access. The off-grid solar sector has seen impressive growth in the past five years: From a near-standing start less than ten years ago, more than 100 companies are now actively focusing on stand-alone solar lanterns and solar home system kits targeted at those without modern energy access. By mid-2015 they had sold 20 million branded pico-solar products (defined as having a PV panel smaller than 10W), mainly portable lights. Pico-solar is becoming mainstream: While off-grid solar has still barely scratched the surface of its potential globally, it is no longer a niche product in the countries that have seen the most concentrated sales efforts. In Kenya, more than 30 percent of people living off the grid have a solar product at home, according to our estimates. The pioneers have helped to create a vibrant market. Pay-as-you-go (PAYG) makes solar kits affordable and helps capture consumer value: PAYG firms sell solar kits against small instalments instead of a lump-sum payment with a technology that locks the functionality in the event of non-payment by the consumer. These PAYG companies have attracted four times as much investment in half the time, compared with those selling products for cash. There are about 20 such companies that provide consumer financing active today, serving almost half a million customers, mainly in East Africa. Financiers are betting that barriers to entry for new PAYG suppliers will remain higher than in the cash sale segment and that customer relationships will run deeper. Both factors promise higher margins. Financing is getting larger – but it’s still a bottleneck for further growth: The sector has attracted more than $511 million of investment to date (including to specialised intermediaries), with a sharp increase in recent years and most attention going to PAYG companies. Inventory-finance constraints have already held back sales of pico-solar lights, and firms extending consumer loans need far larger pools of money to scale effectively. PAYG companies have attracted almost $160 million in 2015, including a record $45 million single debt round by Off-Grid Electric. PAYG companies are likely to continue attracting substantial amounts of both debt and equity in 2016. Off-grid solar is advancing rapidly beyond just lighting and phone charging: Between cost reductions, latent consumer demand and a sales-driven push for higher-margin products, solar home systems capable of powering appliances such as TVs and fans are likely to capture an increasing market share. About 7 million off-grid households will use solar-powered fans and 15 million households will have a solar-powered TV in 2020, according to our estimates. Similar systems will also provide services to small businesses. This report was commissioned by Lighting Global, a joint initiative of IFC and the World Bank. It was produced by Lighting Global and Bloomberg New Energy Finance in partnership with the Global Off-Grid Lighting Association. For more information, please visit this website.